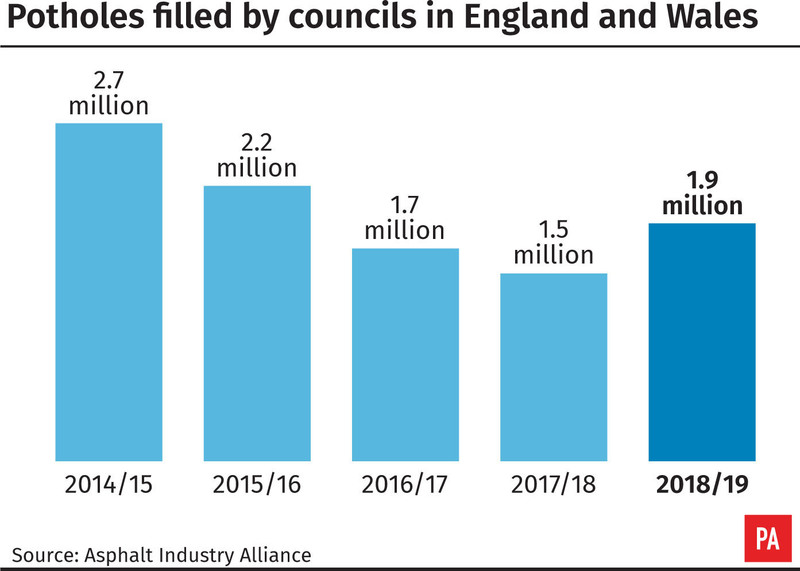 Some 1.86 million potholes were filled in during 2018/19 compared with 1.53 million during the previous 12 months, the Annual Local Authority Road Maintenance (Alarm) survey found. The annual report revealed that highway maintenance budgets have increased from an average of £20.6 million to £24.5 million year-on-year. But the report warned that much of this is being spent on “patch and mend” work which does not provide value for money or improve the resilience of road surfaces. There is also a “big discrepancy” in what different councils are spending on roads. Some local authorities in England received highway maintenance funding equivalent to more than £90,000 per mile last year, while a third continue to struggle with reduced budgets including some having less than £9,000 per mile. Councils would need to spend a total of £9.79 billion over 10 years to bring all their roads up to scratch, the report stated. The analysis is based on council responses to a survey by the Asphalt Industry Alliance (AIA). AA president Edmund King said: “The Alarm survey suggests that the country is beginning to find its way out of the rut. Paul Tuohy, chief executive of Cycling UK, said: “Cyclists, like pedestrians, suffer particularly badly from poor road maintenance, as the outcome is far more likely to involve personal injury. A Department for Transport spokesman said: “Potholes are a huge problem for all road users and the Government is taking action, providing local authorities with more than £6.6 billion for roads maintenance and pothole repair in the six years to 2021.